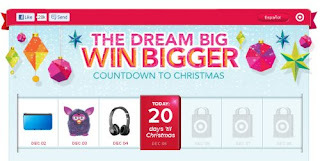 Count down the days and add up the gifts with Target! Each day, at 2pm (CST), we'll reveal a new gift and each day we'll be giving it away to our fans. Just grab your ticket and tune in to the holiday reveal for your chance to win — every day until Christmas Eve!